Saturday Morning Slam 02-23-13 - WrestleCrap - The Very Worst of Pro Wrestling! Let’s find out if that’s a fact, or just another total line of crap. My money is on crap, btw, but it has been for the past 13 years, so make of that what you will. Our opening contest pits Jey Uso versus…JACK SWAGGER??!! Well, for those of you scouring the interwebs for the latest on if that guy is going to be around or not following his DUI, I give you definitive proof that he’s not being canned in the form of a SATURDAY MORNING SLAM appearance. Guessing that half the geeks over on the F4W Boards are pestering poor Bryan Alvarez for a Breaking News Audio on this. Sadly, Uncle Zeb does not make an appearance. That’s too bad, I was looking forward to a race-baiting diatribe explaining to the illegal foreign immigrant children watching this morning that their parents were evil as they stole cable from their neighbors. Who will be joining Josh Matthews in the booth this week? Let’s spin the SMS Commentary Wheel of Misfortune™ and find out. Oh come on now. This show is already losing fun by the episode, and NOW you’re going to make me sit through a half hour or MIZ? The only thing that could possibly save this is if his ever so greasy fiancé shows up. Though come to think of it, a TV-G rated Maryse may not help out either. So the guys lock up and a very boring match starts up, made all the worse by Miz talking about himself. Apparently when WWE needs someone to be a guest commentator, they call him. When they need someone to be a main event superstar, they call him. When they need someone to host Miz TV, they call him. That’s too bad, I’d much prefer, say, “Love is a Battlefield” Evil Pimp Alex Riley to do that. 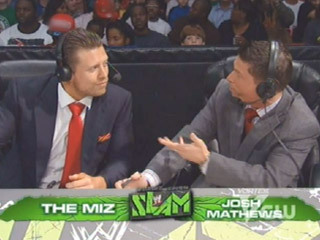 Oh, and props to Josh for noting that he didn’t know WWE named Miz TV before they asked him to do it. We go to our Dutch Oven break (seriously, that’s now on every. single. week. 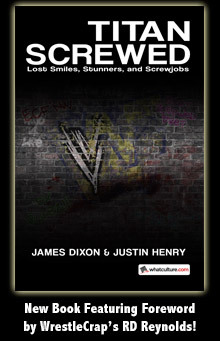 ), and when we come back AJ Lee is here to explain all the things we are not to try at home. She blathers on about protecting yourself. Sadly this does not segue into a condom commercial. Hard to believe that it was just one year ago I thought she was the greatest thing going (her promo with Daniel Bryan discussing their spooning antics will forever be etched in my cranium) and now I want to a throw a brick through my TV any time she is on. What a difference a year (of WWE writing) makes. Back in the ring, Jey and Jack continue their borefest, and I am so enthralled by what I am seeing I begin seriously examining what on earth Jimmy Uso is wearing at ringside. It seriously looks like he went into five different men’s closets and stole something from each one to put it together. That or he just raided that one dude from Los Boricuas’ wardrobe. 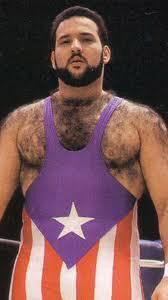 No, not Miguel Perez Jr.. That would make him look like a human chia pet. And yes, that is what this thrill-a-minute encounter has led me to do: Google images of Miguel Perez Jr.. Sheesh. I have to be the first guy in the history of the world to do a search for that. The Patriot Act ankle lock finishes things up, but not before we get discussions of ballet and whatever that was supposed to be above. I’d rant and rave about how they should have edited it out, but what with this being a live show, I guess they can’t. Wait, this show is TAPED? Getouttahere. Off to commercial we go, and we get the now weekly sappy Chuck E. Cheese commercial (wherein the rat explains that this insane asylum is a place where parents can relax!) and Exploders guns, we get a SMS ad where we are told that Saturday Morning Slam is about to CHANGE. That sounds ominous. Having Josh Matthews bound and gagged with duct tape doesn’t give me a lot of hope either. If this show becomes yet another pointless recap show, you’ll need to do the same to me if you think I’ll continue to review it. Kaitlyn is in our Saturday Morning Spotlight. You know what would be great? If they talked about how she looked hotter in her mug shot than she does most weeks on Raw. Thankfully, RD Jr’s babysitter stayed over last night, and she has plenty to say. Yes, Nanny Deal, yes, she sure does. Her opponent this week is Natalya (thankfully not farting). I remember the last time Nattie wrestled on this show, and it was a lot of fun. Here’s hoping she can bail us out again. Maybe she’ll even give us one of her dad’s old ankle high dropkicks. That would rule. That match starts, and Kaitlyn gets a quick roll up for two. Maybe it’s just me, but I think she may be mocking her foe. Miz, meanwhile, gives us some Kaitlyn FUN FACTS. Among those are that she never leaves the house without a pair of jorts (“she like John Cena…but a girl!”) and she only likes cats with human names. For instance, she doesn’t like Miz’s cat because its name is “Spice”. Kaitlyn suggested “Joseph” instead. I am not going to lie – I could watch a half hour of nothing but Kaitlyn telling every WWE Superstar™ what to name their pets. That may be the biggest reaction my dear wife has had since they completely botched the Steph-Hunter-Kurt Angle love triangle, which was actually an expletive-laden tirade that more or less ended he days as a wrestling fan. All you geeks are right – this girl is woefully underutilized. And it actually helps to inspire Kaitlyn to spear poor Nattie and put her away for three. Not as good as some weeks, but anytime The Anvil’s daughter is in the ring? Tune in next week to see what exactly they are going to do to ruin this show next! 8 Responses to "Saturday Morning Slam 02-23-13"
It might be – SHOCKING CHANGES coming!! Judging by the .GIF of the ad you posted, it looks to me like the Primetime Players might be doing commentary next week. Is Jack Swagger the first heel to win on Saturday Morning Slam? It looks like he just might win that world title at Mania. i read one of the possible big changez iz a weekly GM. or maybe a permanent one. we’ll see. Natalya saved the show for me. She was awesome! I loved how she mocked Kaitlyn, and she was just a real joy to watch. MAN MUSCLES are not cute !! big difference between being fit and having a woman face with a man’s body! !